• القسم الرئيسي : لغات أخرى . • القسم الفرعي : English . • الموضوع : Dr Mohamad Ali El Husseini meets with Schudrich and calls for the need to activate dialogue between religions . 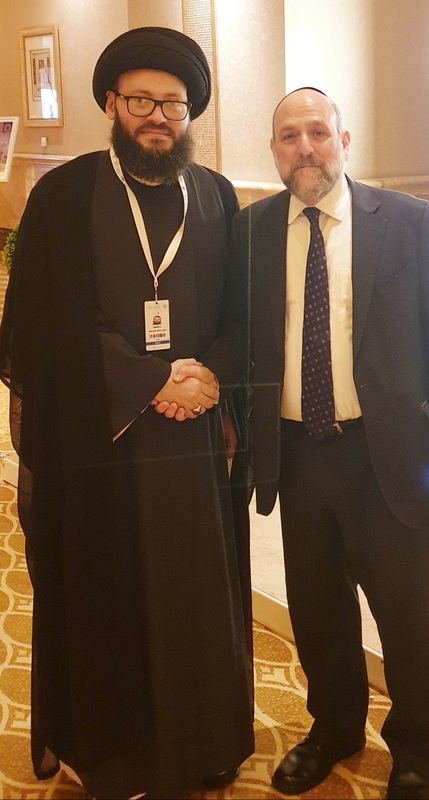 The Secretary-General of the Arab Islamic Council in Lebanon met with Dr. Mohamad Ali El Husseini, the Chief Rabbi of Poland, Michael Schudrich. The two sides exchanged views on the importance of meetings that bring together the symbols of the divine religions. The meeting took place on the sidelines of the Humanitarian Brothers Conference where he stressed the importance of serious dialogue based on openness to the other and acceptance of it as it is. • Sayed Mohamed Ali El Husseini: "Nous rejetons l'abus et l'exposition aux lieux de culte qui se répandent l'amour et la tolérance, la coexistence pacifique et la non-violence loin de la haine, et la violence". • كتاب: خصوصيات ومستحبات يوم الجمعة khsousyat wmsthbat youm aljma'ah تأليف:السيّد محمّد عليّ الحسينيّ"اللبناني".